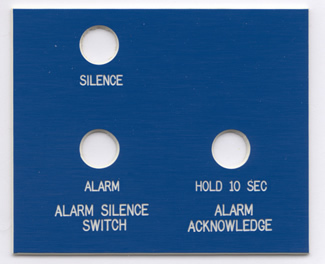 Referred to as "mill tags" or legend plates, we produce these engraved identification tags singly or by the hundreds, all to your exact specifications! Whatever your marking need, we can provide cost-effective marking solutions. We cut your tag to order at no additonal charge so whether you need a 1"x3" tag or would rather have a 1 1/2" x 2 3/4", we can fulfill your request. Comply with OSHA regulations, provide instructions or guidance, identify equipment, and more. Tags in any size or shape, done exactly as you wish. If you need tags to wrap around wire bundles, we can do those too! Click here to learn about our cable tags. Have a special engraving need? We can help - quickly and cost-efficiently! Looking for the other kind of legend plates? Just click HERE. And just so you know: at American Nameplate we'll store your order in our engraving program so that you can order at a later date and get a consistent supply of what you need without the hassle. There's no setup charge, no minimum. 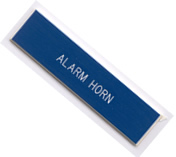 Manufacturers, distributors, mills, electricians, carpenters, contractors, and production facilities of all kinds have multiple uses for these tags. See for yourself how easy and inexpensive it is to do business with American Nameplate while you enhance your business productivity through easily marked machines and equipment - and meet those OSHA compliance regulations in a timely and reasonable manner!